An awful lot of cooks have been involved in preparing this ‘Feast’, and though they’ve not exactly spoiled things, they have rather muddled them. A nominal delve into the culture of the Yoruba people of West Africa, the production is a collaboration between the Young Vic, the Royal Court, director Rufus Norris and five playwrights from the Yoruba diaspora (Yunior García Aguilera, Rotimi Babatunde, Marcos Barbosa, Tanya Barfield and Gbolahan Obisesan share the credit for all the writing). 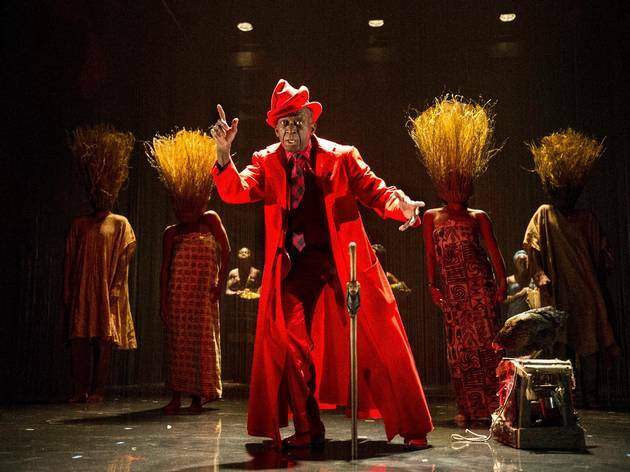 It starts and ends wonderfully, with two energetic, illusion-heavy sections in which Kobna Holdbrook-Smith’s buff trickster god Elegba merrily sings, dances and shapeshifts his way through a potted introduction to the 401 deities of Yoruba mythology. These sequences have the making of the witty, joyous visual extravaganza that this might have been – a ‘Feast’ for the senses, if you will. 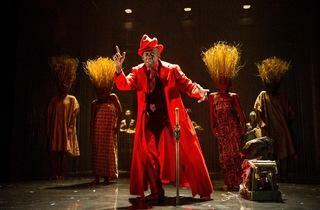 In fact the bulk of the play is only lightly informed by Yoruba lore per se, being a series of slightly worthy playlets about key moments for the black African diaspora as a whole: the abolition of slavery in Brazil; the dawn of the civil rights movement; a multitude of scenes set in the present day.